Paul appeared before three governors. The commander had sent a letter to Felix, the Roman governor, stating the charges against him. Five days later the Jewish leaders with their lawyer, Tertullus (TURTUL us), arrived. He presented the Jews' case and Paul responded to the charges. Felix kept Paul in prison for two years, sending for him frequently and talking to him. Paul next appeared before Festus (who became the Roman governor after Felix). Again the charges were brought against him and Paul defended his innocence. He told Festus he wanted to appeal to Caesar to try the case and his request was granted. Before the time came for him to be sent to Rome, King Agrippa arrived in Caesarea (ses uh REE uh) with his wife Bernice. Festus discussed the case with him and the king said he would like to hear Paul speak. The next day Paul was brought before the king. He told the king of his conversion and how he had changed from being the persecutor of Christians to being a Christian himself. Festus accused him of talking like an insane person. 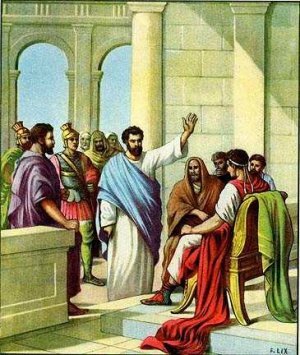 Paul continued reasoning with the two rulers. Finally the governors left the room. They said to one another that Paul had done nothing to deserve death or imprisonment. Agrippa said Paul could have been set free if he had not asked to be sent to Caesar for trial. We know, of course, that God had plans for Paul in Rome and it was necessary for him to go. Paul was not afraid. He spoke boldly of his faith before the governors. Are we always bold to speak? Do we speak up for Jesus even when we know the message may not be received well? Be always ready to tell people about your faith and about the Lord Jesus. Make opportunities to share with others, and be ready to walk through open doors that God will provide. English Bible Activities Select story #266-267 in the list for activities to accompany this Bible story. Spanish Bible Activities Select story #266-267 in the list for activities to accompany this Bible story. Agree with the other comments that a printable picture to color for each story would be a great help. This page displayed 46,145 times.